Leather Lane market is unique. Coming to prominence in the late 19th century as one of the centres of London’s ‘Little Italy,’ it’s one of the most vibrant streets in central London. Take a look at its website, and you’ll find a detailed profile of the people who work the street’s stalls. Community and shared history is extremely important to Leather Lane’s success. The market is on from 10-3 on weekdays. There is so much to offer, but here’s a few of the best. 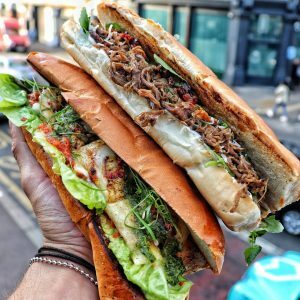 Street Food: if grab and go is what you’re after, you can’t do better than Sub Cult, with their masterpiece steak subs. For Mexican: Daddy Donkey is putting London burritos on the map. Their lunch deal gives you a burrito-bear for a tenner. For something slightly more upmarket: Kin is a gorgeous corner restaurant that specialises in Southeast Asian cuisine. Try the Tom Yum soup. 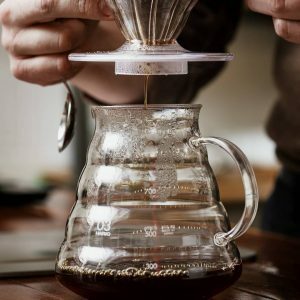 For coffee: Prufrock Coffee, in its large and bright space, is almost always rammed—try one of their flat whites to understand why. If tea’s more your thing: Good and Proper Tea will serve you right. The near-30 types of teas might seem overwhelming, but the staff will guide you through. And for beer: the Craft Beer Co, with its huge range of speciality ales, is the one to hit. For really getting a feel for the local flavour, check out Dave’s Oven Baked Jacket Potatoes. Dave has run the stall for the past 10 years. He’ll give you the run down on how the street is changing. Neighbouring Hatton Garden, with the most jewellery stores in London, by some measure. Or try any of the wonderful restaurants around Clerkenwell–London exploring never ends.